There was vacation, and there’s always work, and there’s actually working on the costume… so I haven’t posted much progress lately. And all the photos are taken late at night with my cameraphone, so there’s that. But here’s how it’s going. 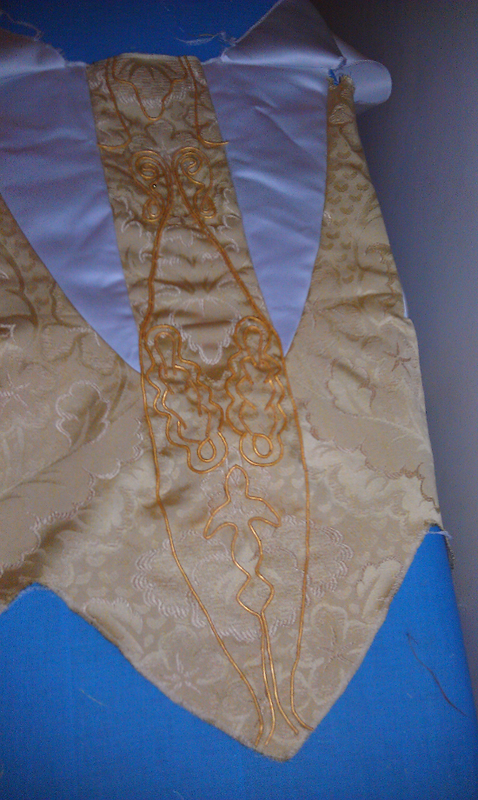 The right way would have been to make the piping, then insert it into the seams. But I just knew I could shave off some time doing it all at once. When I started ironing them flat, I realized just how inconsistent the width of the piping was. I’m not a perfectionist. I’m usually a close-enoughist. But this time I knew what I had to do. I took apart the entire skirt, all 24 panels, all 184 feet of stitching, and I started over. I made the piping first, then put it in. If you figure I’d already done some of them 2, 3, or even 4 times in places trying to even it out to fix my cheat, that’s about a tenth of a mile of seams. I’ve put a few of them together. They still need a lot of ironing, but you can see it will be the skirt! Then I started worrying that the points would lose their pointiness after travelling to Atlanta and hanging in a closet for a while. 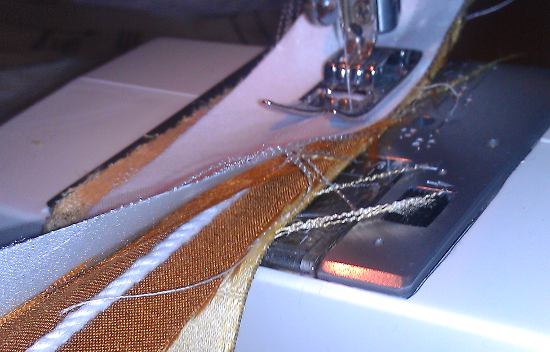 So I started thinking about stitching in the ditch between the piping and the panel. It’s a slow-going process to keep it from being a disaster on the second side, but I think it’ll work. Finally, the bodice. 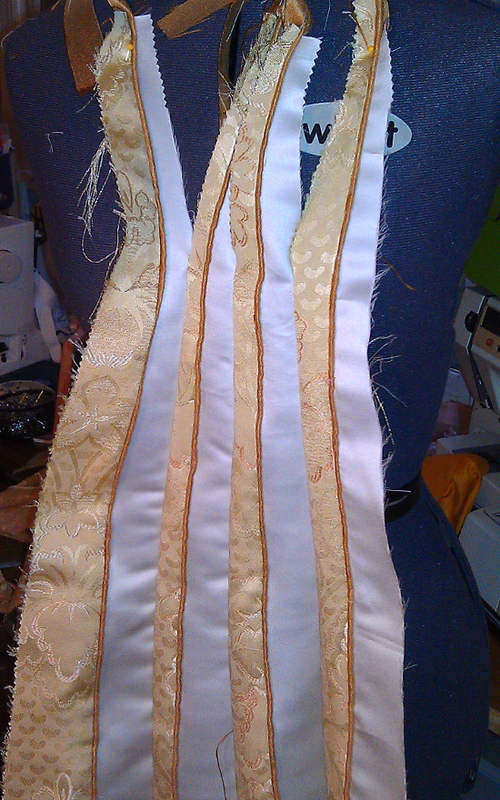 I’ve gotten most of the leather piping sewn to it. Next up, gold beads and sequins. I’m just in awe. I can’t wait to see it all done. Are you entering one of the contests at DragonCon? Thanks! I do plan to do the Friday night contest. The competition’s gotten really fierce in there the last year or two though! Yay! I already had that on my schedule to attend. I was hoping to get a glimpse of your dress in person! I thought about entering a contest, but I think my skill level’s not up to par for the Friday night costuming contest. Maybe one of the others that isn’t focused on construction. Good luck! If it’s your first contest, you could enter as a novice. I think you could school it with your Baronness! Aw, thanks for the vote of confidence. I’ll definitely think about entering as a novice. Last year was my first year going to Dragoncon, and it was just so intimidating seeing all the amazing costumes. I feel like a tiny fish in a big pond. 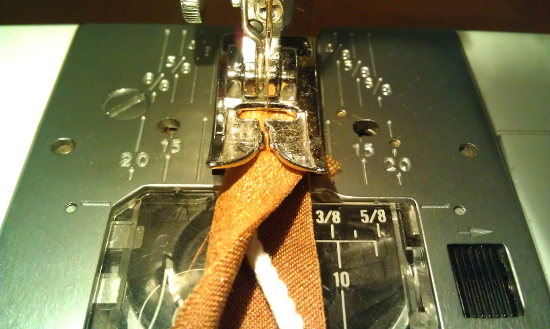 I’m glad I’m not the only one who counts up redone seams in terms of miles of sewing! The Ravenna dress looks like it is going to be smashing! 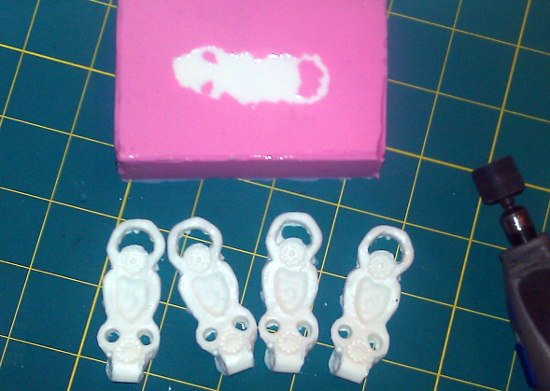 Did you find resin casting complicated and/or messy? I’ve had to face reality for my first Dragon*Con – no costume for me this year. I’m going to take a ton of notes and pictures, though, so I can hopefully go in as a novice next year! Nice job so far! 🙂 I’m doing the crown and black feather cloak this year! woot! I found out the hard way that ripping out what you’ve done is one of the greatest teaching tools….